The Kingdom is in grave danger. Powerful enemies are conspiring to resurrect the vile and powerful UnHallowed that your party has just slain. Now you, the mighty adventurers of the land, must visit these summoning locations and defeat the hordes of creatures behind this evil plot. It falls to four mighty adventurers, each of whom has a unique set of skills, to ban together once more to vanquish this evil before the Unhallowed consume the world in darkness. 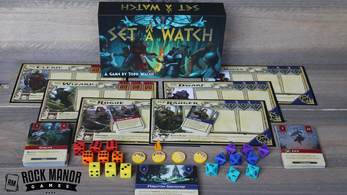 In Set a Watch, a cooperative game for 1-4 players, you must clear out nine locations to stop the acolytes from breaking the seals holding back the evil UnHallowed. Every round you will visit a new location and pick an adventurer to rest and take camp actions. 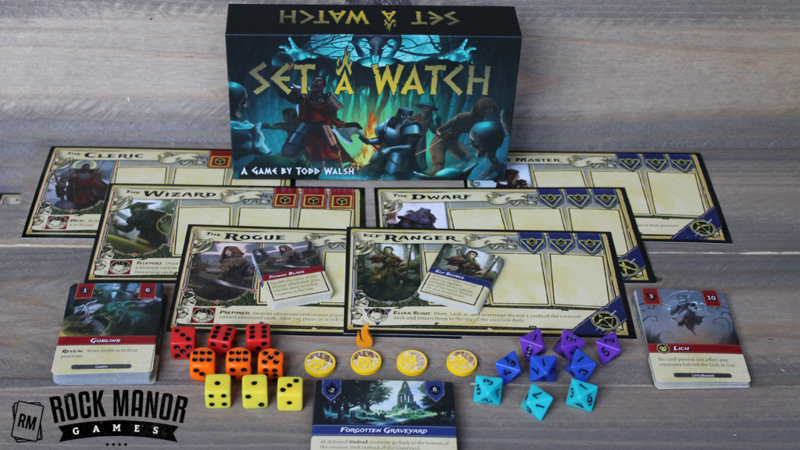 The rest of the party will take watch and battle a line of monsters trying to make their way into camp using your dice and unique character abilities. Manipulating the creature line is essential to solving each round’s combat puzzle. It is a battle to stay alive and keep the campfire burning! Use your wits and skill to fight for the light…or all will perish in the darkness. No Unhallowed card in file SAWproduction English.zip.